Share the post "Her Ice Man"
Another of my appointments today was with the director of Prairie Place on 1st. We talked about the units remaining, along with the number of people that’ve been showing interest, but not stepping forward to make offers. We decided it’s the time of the year as well as this crazy weather that’s been holding them back. During these bitterly cold months, most older people stick much closer to home and don’t venture out other than going to their banks, their doctor appointments, their churches, and their favorite grocery stores. It may sound sad, but they’re perfectly happy with their weekly regimens. Stability and safety is something nearly all seniors want in life while on the journey of their golden years. Yes, there are those who like to travel, along with being involved in many circles, but for the most part, the bulk of them stick pretty close to home, and that’s just fine by them. Knowing I’ve spoken about this before, I feel it once again appropriate tonight when saying most of our younger generation don’t realize how important churches are to a very many seniors living in our community. For them it’s an extension of their even broader family because they grown to understand that they’re all part of a “family” of faith. Throughout the week there is always something happening at the larger churches to where I believe for some, there are classes, workshops, bible studies, circle meetings, and the list goes on. For example, tomorrow is another Wednesday noontime musical event called, “Brown Bag Bach” that takes place each Wednesday all during Lent at Trinity Lutheran Church. You see, there’s always something interesting going on at one of our City’s churches during the week. Hopefully by the end of this week, I’ll have a new listing posted. I spoke with the sellers today, and I believe they’re ready to list with me. If it’s priced right, there’s no question in my mind that it’ll sell relatively quickly. Another dear client stopped by my office yesterday to tell me he’d given my name to a friend of his who’s getting ready to sell his home which is in one of our sought after neighborhoods. Now that so many of my listings are selling, I’m more aggressively going after new ones so to be ready for our spring market. 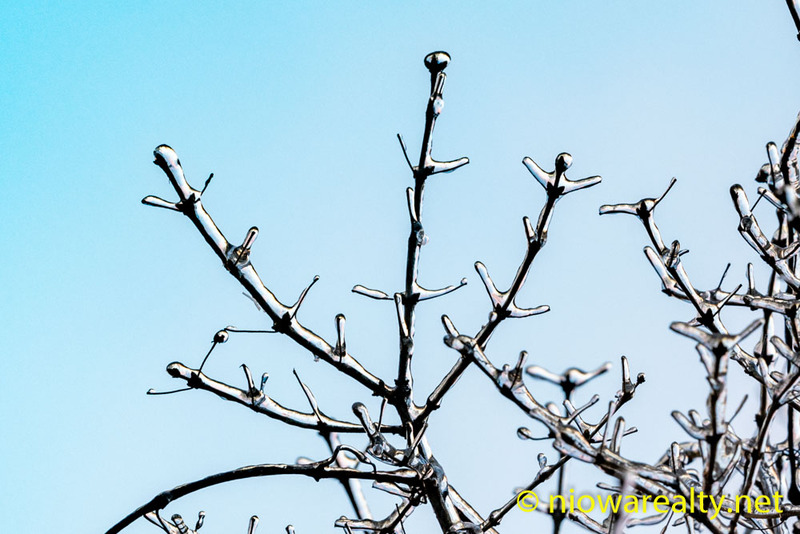 The above photo is one I took today of ice-covered branches. You can see on the end of one of those branches, a formation that looks like a man holding out his arms and getting ready to jump. Mother Nature did a great job in creating her ice man readying himself so to take flight.